This was Barry White's last album for 20th Century Records, and it was released at the same time as his first one for his new label, CBS, ("The Message Of Love"), so it got virtually forgotten about. That was a bit of a shame, as it is a good soul album, a sort of celebration of soul music, with a variety of influences at play - Motown, Atlantic, Stax, funk, sweet soul. All of those are in here on an album considerably different to the previous ones. 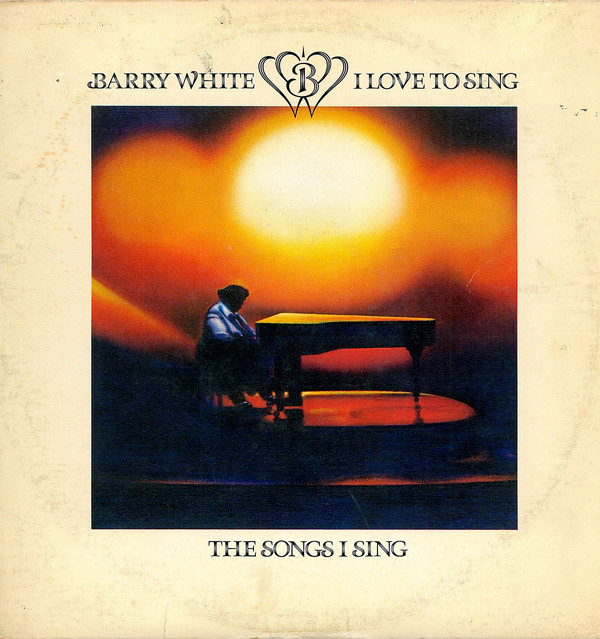 Barry begins the album by telling us that "I Love To Sing The Songs I Sing", not in an extended, growling, semi-spoken style, but in a short, sharp, Motown influenced poppy toe-tapper. It is completely different to any of the material on all his previous albums. "Girl, What's Your Name" starts with a more familiar spoken intro, but soon launches into a sweet, soulful, Delfonics-style soul ballad. It is a beautiful song. Again, it is comparatively short. 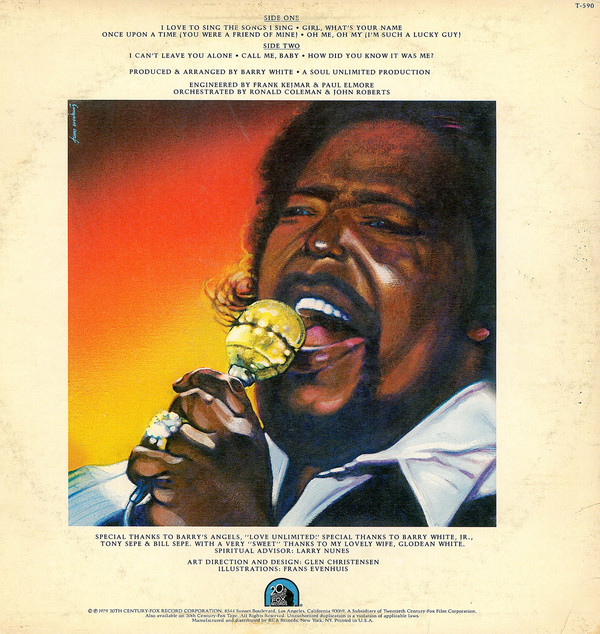 Four minutes is short in Barry White terms. "Once Upon A Time (You Were A Friend Of Mine)" is a sumptuous soul ballad in the Harold Melvin style. "Oh Me, Oh My (I'm Such A Lucky Guy)" ends the original "side one" with a slow burning gently smouldering ballad more typical of White over the years. It has a big, full bass sound and some excellent strings and percussion. Horns are also used, as they are on quite a bit of this album, a rarity for White. The second side kicks off with an Atlantic soul-sounding track in "I Can't Leave You Alone" which, although not the George McCrae track of the same name has some similarities. It also has huge Aretha Franklin influences, as if it is White's homage to her. Atlantic/Stax-style horns punch their way all over this. Again, it is like nothing White has ever done before. "Call Me, Baby" sees Barry bring in the funk. A funky bass, guitar and drum riff underpins the whole lengthy, eight minute, workout. Once more horns are present. This is as funky as Barry has been thus far. The track gets into a groove and the last few minutes are instrumental, but it always remains rhythmic and invigorating. The sound quality on the latest remaster is excellent too. The album ends with "How Did You Know It Was Me? ", which is a sort of Philly soul meets disco number. It is infectious, vibrant and upbeat. The horns are excellent. Barry's vocal is soulfully powerful too. I am at a bit of a loss as to why this album disappeared without trace. Marketing, I guess. It was recorded as a contractual obligation. That doesn't mean to say it is a throwaway album, though. There is quality material on here. I actually really enjoy listening to it every now and again. Anyway, that was that for Barry White's glory years. For me, I have the first album on CBS (see my review) and that was that for me too. They had been six wonderful years too and the best of Barry White is so evocative of the period 1973-79, particularly 73-75. He left an impressive soul legacy. His influence cannot be underestimated.